We educate, engage and inspire organisations to be part of the solution by rethinking, better managing and reducing soft plastic waste, so together we can create a more sustainable future. Soft plastics collected through Plastic Police® are manufactured into a range of products by our Australian-based processing partners for participating organisations to purchase back, enabling them to close the loop on what is collected. 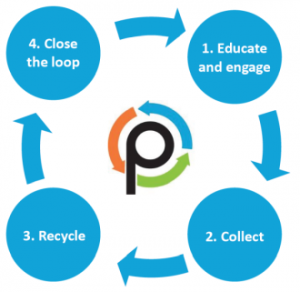 Educate & Engage: We educate, engage and inspire organisations reduce soft plastic waste. Collect: Set up a soft plastics recycling station within your organisation. Recycle: Soft plastics are manufactured into products such as asphalt and furniture. Close the loop: Participating organisations purchase products to offset the soft plastics collected. If you can scrunch it, you can save it! Soft plastics are plastics that can be scrunched in your hand. Household generated soft plastics include plastic bags, bread bags, bubble wrap, chip packets, snack wrappers, postage bags and cling wrap. Business generated soft plastics include product packaging, shrink wrap, pallet wrap and builder’s sheeting. Soft plastics are recycled into new and useful products for organisations and communities. The younger students are really getting into recycling. They come to school and see all the things we are doing for the environment and to be more sustainable. They take these learnings to their parents and want to start recycling soft plastics at home too. Our staff are separating their soft plastics at home and bringing them into work to recycle. The Plastic Police® program is making them realise how much waste they produce and this is inspiring them to come up with solutions for reducing soft plastic waste in the business. Knowing that the soft plastics is getting recycled is a peace of mind for us. Participating in this program is essential to helping solve the issue of soft plastics contaminating the environment and being a hazard to our wildlife.